Luang Prabang is an oasis of tourist friendly (and safe) places to eat, with dishes sourced from the Mekong & Nam Khan rivers, as well as plenty of vegetarian and vegan dishes from the lush farmland that surrounds the city. The richness in culture, architecture, and cuisine makes Luang Prabang a magical place to visit. For all my plant-based foodies, all of the restaurants listed below have great options for you on their menus. You will never pay more than $8 for your meal - including alcoholic beverages - at any of these restaurants. Lao food makes use of the country’s abundant fresh vegetables and vibrant spices such as lemon grass, hot chillies, peanuts, coconut milk, and ginger. This riverfront restaurant has a HUGE menu, so you are bound to find a dish that will satisfy your taste buds. From freshly caught river fish stuffed with garlic and chili to a beautifully detailed vegetarian menu, Tamarind Tree will leave your tummy full, but still wanting more after your meal. For a full on mouthgasm, order the green bean stir fry cooked in spicy Lao chili, garlic, and onions for only ₭20,000 ($2.40 USD). You can also enjoy a strong gin and tonic for ₭20,000 ($2.40 USD) while you soak up the atmosphere of the fast flowing Mekong River as fishermen and river taxis make their way up and down the Nam Khan River as it flows into the Mekong. Eat and drink your heart out for under $5 - you can drink a lao whiskey or local beer plus enjoy an entree and appetizer for under five bucks at the thriving night market in Luang Prabang. The bustle of the night market will leave adventurous travelers in awe as people from all walks of life shuffle through the market, with its low-hung ceilings constructed of sheet metal, in search of a delicious traditional meal. However, travelers be warned: be careful what you eat. Although there are many westerners dining here, ALWAYS be cautious about what you select when eating street food. The last thing you want is to be stuck in your hotel room, vomiting for three days straight because you ate something your stomach could not handle. Tourists are far more prone to getting sick from food-borne bacteria then locals, so be cautious. Always avoid uncooked food or food that looks like it has been sitting outside for hours on end. I ate here four nights in a row during my stay in Luang Prabang because the price and taste was unbeatable; I did not get sick. Safe bets for foreigners include Lao sandwiches, noodle soup, smoothies, and coconut pancakes (unbelievably scrumptious). There is a row of “sandwich vendors beyond the heart of the market who have tables and chairs set up in front of their shops - a perfect option for travelers who may be overwhelmed by the busy market place. These ladies sell crepes, smoothies, french fries, and a whole lot more. I was instantly addicted to the tofu and avocado Lao sandwich, as well as the Lao whiskey smoothie with dragonfruit, lemon, and passion fruit. However, if you have an extra sensative tummy, like myself, I recommend ordering your sandwich without the raw veggies that come on top. Another awesome option for cautious travelers are the soup ladies in the heart of the night market. This night market is hands down one of the top options for vegetarians and vegans as you can hand pick all the ingredients for your soup. Watch them boil the soup right in front of you...and don't forget to order the spicy broth! One thing to avoid are the spring rolls. I tried the spring rolls on two occasions; each time they were dry and stale. The night market is the best option for budget travelers and those who seek a more exciting culinary experience. 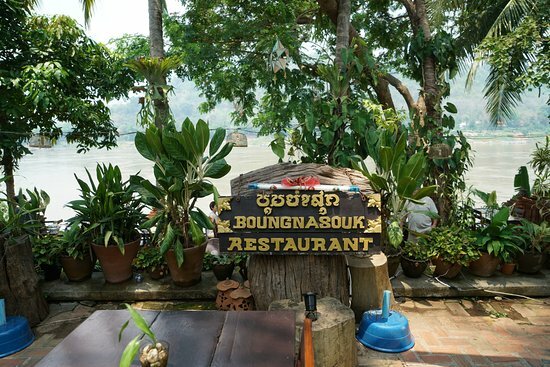 Although LPB Food may not be the #1 choice for dining along the Mekong, it certainly has the best view of the river! If you eat around 2 p.m. you can watch a local rowing team practice crossing the Mekong with their melodic chanting. L.P.B. Food is well worth the money if you're hungry or need a break from sightseeing. I ordered the coconut milk tofu curry soup (₭20,0000) and a green papaya salad (₭8,000) - both 100% vegan. This was hands down the tastiest and spiciest green papaya salad I found in Luang Prabang. The tofu curry soup was fine, but nothing special. If you are looking to have a romantic lunch or simply enjoy a beer or cocktail along the river, then this is the place for you. As for the toilet situation, they have an Asian tiolet across the road from the restaurant, but it is not very clean. Boungnasouk Restaurant has an awesome selection of ever changing specials with an excellent array of river fish, shrimp, and veggie dishes. 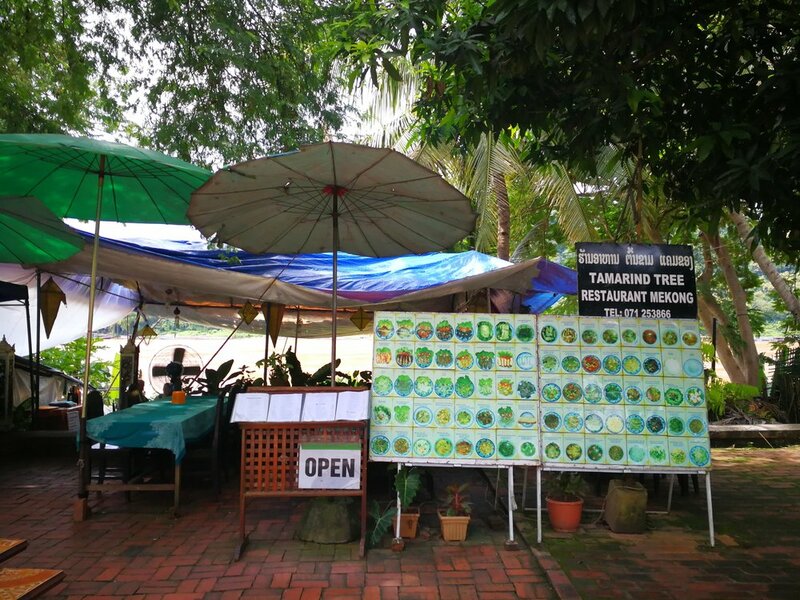 This fully-shaded riverfront restaurant features a relaxing view of the Mekong and is keen on catering to the needs of tourists. If you like to stay away from meat and fish, the tofu vegetable stir fry with cashew nuts is out of this world! If you like spicy food, be sure to order your dish extra spicy as the dishes we ate here lacked any sign of chilis. Opening Hours: open for lunch and dinner.